So if anyone would love to share pics or descriptions of their altars it would be lovely. I always find it just amazing the beauty & creativity that go into some altars & shrines. 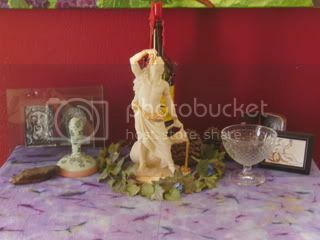 Here's my Dionysos shrine. It's pretty simple. The statue is kinda ubiquitous, but I fell in love with it. The artwork is my favorite part - all original pieces from several artists that I know. I think mine would be more "creative" than beautiful. To start with, it's a piece of plywood superglued to beer bottles. It's not set up as it usually is right now because I was using it to launch fireworks from and it's now a scorched piece of plywood. Maybe a bit strange, but at least I can say it's unique. Also, I think it's rather fitting. I'll have to get pictures of it sometime. Might even have some pictures with the fireworks on it. I am in the middle of moving. Everything I own is packed up and will be being unpacked in my new place over the next week or two. I've been working on my own space, so far it's just an old end table with a big drawer in it and an empty fish tank. LOL mine is the top of a tv stand, the two shelves have my cable box and dvds. It's the main altar since that's where the family spends most of our time. (Family room). It also is used as a seasonal altar too. I think mine would be more "creative" than beautiful. To start with, it's a piece of plywood superglued to beer bottles. It's not set up as it usually is right now because I was using it to launch fireworks from and it's now a scorched piece of plywood. I keep mine in a glass cabnet, I should get it all put together and take a picture to post up here. Most of my altar is consisting of rocks and feathers. A. Tv on top of it. It is presently sitting in a bay window space...so It actually fits the bill of an alter circle but it to is not big enough...and I'm not a builder so I cant fix that part. I'll get around to it...I still have tons to learn. "In the parlor there were three. He, the parlor lamp, and she. Two is a party but three is a crowd so the parlor lamp went out." it is rather an oxymoron lol. Either way it is niffty...does not replace a real one though. nothing like the wood crackling while I sleep. Heh, mine is of the 'little money, less room' variety. It's set up on the corner of an old dressing table I have shoved into the corner of the room to use as a desk. 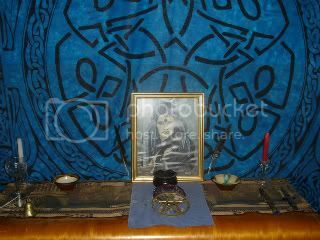 I have postcards of Hecate and Brighid blu-tacked to the walls, with a rock salt tealight holder between them, which I replace with a jar candle (not necessarily the particular fragrance, although it is a favourite) for Cill shifts. That's all. I share the room with a toddler, and I can't afford to have trinkets lying around that will draw his attention. Mine is on top of my dresser drawers, it has a world map on it, an empty vase with a bird and pink/green ribbon, a worry stone...a dish for incense, an old used Seattles Best coffee can to burn it in, sea salt, used white votive candles, a candle holder...its a giant mess. Need to coordinate it. So if anyone would love to share pics or descriptions of their altars it would be lovely. 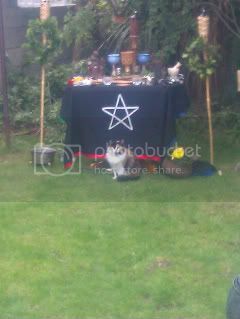 Here's the one we set up in the HPriestess's garden for Midsummer. I now just have an altar in our spare room just with the general Working Tools that I add stuff to depending on working. I also have a statue of An-Mhór-Ríoghain on top of my dresser, where I also keep an offering bowl, incense, triskelion, silver Harp, and a few items I've received in initiations. I also put a few jewellery items there wen not wearing them. Also, since these altars are fairly modern influenced, and because pre-Christian Celtic altars were in natural settings, and most(but not all) of their deity statues come from areas that came under Roman control to coincide with state-politics(they thought it humorous of the Greeks to have status of their deities in anthropomorphic form at the sacking of Delphi) , I have an outdoor shrine in the garden for offerings in a flowerbed with a stone I lifted from Eamhain Mhacha, or else I just visit sacred sites. If I ever get around to cleaning my room I might use my dresser as an alter... its has a mirror and quite a bit of space. As well I don't use it so the drawers can be reworked to hold all ritual items. Not to mention I have two porcelain statues I can use to represent the god / goddess that were given to me by my grandfather. Now to find the rest of the items needed for an alter set up.